In its May 22, 2016 decision last week, the Greek government then added still more austerity. That vote raised the sales (VAT) tax to 24 percent, imposed higher taxes on coffee, alcohol and gas, revised the privatization program to accelerate the sale of publicly owned transport, electricity, water and port systems, added finances to cover Greek banks’ growing backlog of non-performing business loans, and added contingency measures to cut government spending even further over the next three years should Greece miss the austerity targets imposed by the Troika last August 2015. 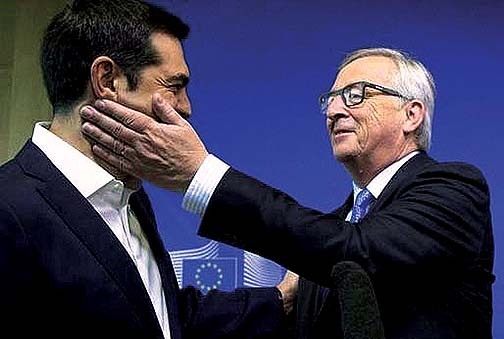 By latest estimates total Greek debt is 384 billion euros, or US$440 billion. That’s approaching nearly twice the size of Greece’s annual GDP. A decade ago, in 2007-08 before the global crash, Greek debt was roughly half of what it is today, in terms of both total debt and as a percent of GDP. Greek debt was actually less than a number of Eurozone economies. So Greece’s debt has been primarily caused by the 2008-09 crash, Greece’s six year long economic depression followed, the extreme austerity measures imposed on it by the Troika during this period which has been the primary cause of its long depression, and the Troika’s piling of debt on Greece to repay previously owed debt. Contrary to European media spin, it’s not been rising Greek wages or excessive government spending that has caused the US$440 billion in Greek debt. Since 2009 Greek annual wages have fallen from 23,580 to less than 18,000 euros. Government spending has fallen from 118 billion euros to 82 billion. 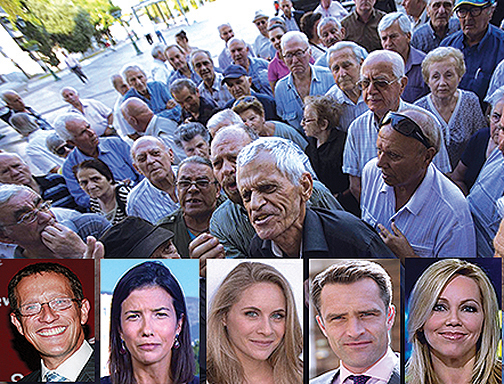 Who then has benefited from the escalation of Greek debt? To whom are the payments on the debt ultimately going? 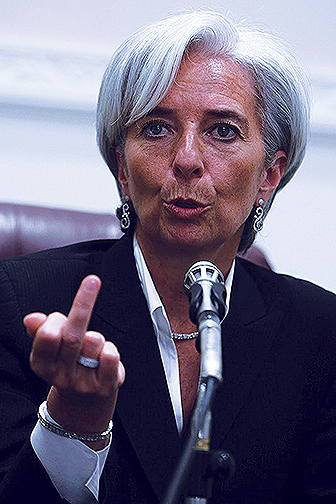 To Euro bankers and to the Troika, which then passes it on to the bankers and investors, the ultimate beneficiaries. As a recent in depth study by the European School of Management and Technology, ‘Where Did the Greek Bailout Money Go?, revealed in impeccably researched detail, Greek debt payments ultimately go to Euro bankers. 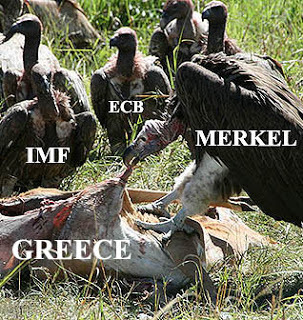 For example, of the 216 billion euros, or US$248 billion, in loans provided to Greece by the Troika in just the first two debt deals of May 2010 and March 2012, 64 percent (139 billion euros) was interest paid to banks on existing debt; 17 percent (37 billion euros) to Greek banks (to replace money being taken out by wealthy Greeks and businesses and sent to northern Europe banks), and 14 percent (29 billion euros) to pay off hedge funds and private bankers in the 2012 deal. 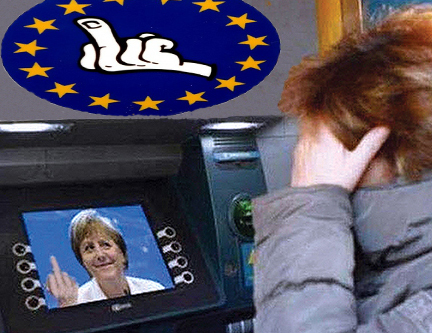 Per the study, less than 5 percent of the 216 billion euros went to Greece to spend on its own economy. As the study’s authors concluded, “ the vast majority (more than 95 percent) went to existing creditors in the form of debt repayments and interest payments”. And that’s just the 2010 and 2012 Troika deals. Last August’s third deal is no doubt adding more to the totals. Instead of forcing Greece to generate a budget surplus of 3.5 percent a year, out of which to repay the loans and achieved by means of severe austerity, the IMF also proposes to reduce the annual budget surplus to 1.5 percent. That would reduce Greece’s debt from 200 percent of GDP to “only” 127 percent… by 2040. Even that nominal debt reduction would fail, per the IMF, if Greece’s GDP grew at only 1 percent. It’s been declining at -5 percent and more for the past six years, so even 1 percent is highly unlikely. If Greece’s growth is 1 percent or less, then the IMF admits the other European states will have to add still more debt piled on Greece in order for it to repay the old debt. In short, the IMF version of ‘debt relief’ for Greece has little chance of economic relief for Greece. Nor does it mean any reasonable change in austerity for Greece. Things will get worse, just perhaps worse not as fast as in recent years.